NARIP member Tammy Hurt of Placement Music, also a board member of Georgia Music Partners, was instrumental in securing an amendment to the Georgia Entertainment Tax Credit. Benefits to music business professionals now include music production as an attributable expense for qualified production, a move which aims to make Georgia an even more attractive state for industry and creatives. Hurt is picture here along with Governor Nathan Deal and the board of Georgia Music Partners (GMP) at the signing of the amended Georgia Entertainment Tax Credit. The credit is expected to increase music production in the state for those movies and TV series that are filmed here. 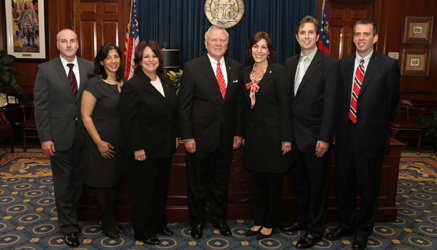 Photo (L-R): GMP Co-President Simon Horrocks, GMP Executive Director Mala Sharma, GMP Co-President Tammy Hurt, Governor Nathan Deal, The Recording Academy Atlanta Chapter Senior Executive Director Michele Rhea Caplinger, GMP Public Relations Consultant Scott Mills, and GMP Secretary Andrew Schutt.